Séminaire with Mario De Mol ! (August 2010) Most of the web page have been translated already. 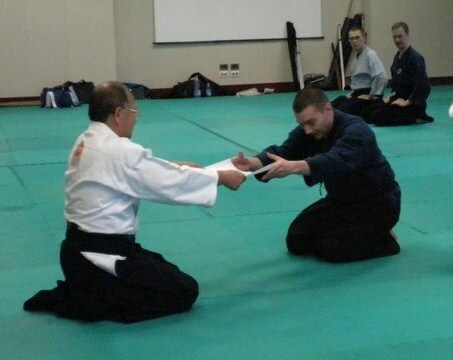 April 2010 : Nicolas passed 3rd Dan test ! (picture). Welcome on Jinenkan Jissen-kobudo Toulouse (France) homepage ! Our Dojo in Toulouse, follows the teaching of Master Manaka : the inventor of Jinenkan, which is inspired by Nin-Jutsu (the art of ninja spies of feudal Japan) but also includes several Martial arts which belonged to the samurais. 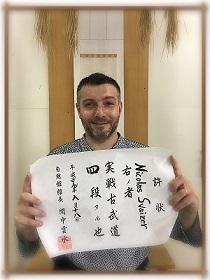 That is why we prefer to use the generic name of JISSEN-KOBUDO (Literally "ancient martial arts for real fight"), the latter describes best our discipline, although the term Nin-jutsu is more popularly known. Jissen-Kobudo is a martial art closest to a real fight situation, including the most effective techniques. It is for this that there are no competitions, because a lot of the techniques are too dangerous or too effective to be used in martial arts competitions. Our purpose is to teach traditional martial arts, as they were passed down during the centuries. In particular, we insist a lot on a correct apprenticeship of kata (codified forms). In the Japanese martial arts spirit (or even Chinese, Vietnamese…), the forms are used to pass on the spirit of the warriors who preceded us, and who selected and tested on battlefields the techniques which worked best.